The SEC came into Week 2 of the new college football season with nine teams ranked in the AP Top 25, but Arkansas, Tennessee and Mississippi State all fell by the wayside following losses. Auburn also took a big step backwards from No. 6 to No. 18 following the Tigers’ tighter than expected 27-20 victory against Jacksonville State as heavy 39-point home favorites. Alabama remains at the top of the list in this conference at No. 2 in the nation following its routine 37-10 rout of Middle Tennessee, but the Tide failed to cover against the spread as 34.5-point home favorites on 5Dimes’ closing college football betting odds. This Saturday night, Alabama will open conference play against Ole Miss as a seven-point home favorite. The Crimson Tide has failed to cover in seven of the last 10 meetings and they are just 1-4 ATS in their last five home games against the Rebels. One of the top matchups in the SEC this Saturday pits Auburn on the road against No. 13 LSU in a key showdown in the West Division title race. LSU is coming off a 21-19 victory against Mississippi State as a 3.5-point favorite on the road. It has been opened as a seven-point home favorite against Auburn for this Saturday’s matchup. 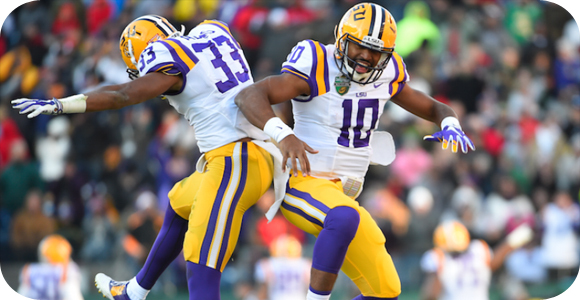 Both of these Tigers have been tough bets lately with Auburn coming in with a 1-4 record ATS in its last five games and LSU sporting a 1-3-1 ATS record over its last five contests. LSU has the clear edge in this matchup straight-up with a 6-2 record in the last eight meetings that includes a perfect 5-0 mark at home. When it comes to covering the spread, Auburn has the advantage with a 4-1 record in the last five games. In a matchup of two other unbeaten teams in the SEC, the 2-0 SU (1-1 ATS) Florida Gators will go on the road as three-point favorites against the 2-0 SU (1-1 ATS) Kentucky Wildcats. Florida failed to cover this past Saturday in a tight 31-24 victory against East Carolina as a 20.5-point home favorite. Kentucky remained perfect on the year with a 26-22 upset of South Carolina in its SEC opener after closing as a seven-point underdog on the road. The Gators bring a SU five-game winning streak against Kentucky into Saturday’s matchup and they are a profitable 7-1 ATS in the last eight meetings. I am off to a 1-1 start with my SEC weekly picks after Georgia failed to cover as a 18-point road favorite in last Saturday’s 31-14 victory against Vanderbilt, but I have a solid line on this week’s pick to get me back above .500. The Arkansas Razorbacks started the new season ranked No. 18 in the initial AP Top 25, but their stay did not last long following this past Saturday’s stunning 16-12 loss to Toledo as 23-point home favorites. This Saturday, they will play host to the Big 12’s Texas Tech Red Raiders as 9.5-point favorites. Texas Tech started the season with back-to-back victories against Sam Houston State and Texas El Paso in which it scored a combined 128 points. However, defensively these heavy underdogs combined to score 65 points which should be a major concern when breaking down this week’s matchup. It is hard to say exactly what happened to the Razorbacks in last week’s loss after they pounded Texas El Paso 48-13 in their season opener as 31.5-point home favorites. It was obvious that they could not score from the Red Zone with just one tally in five trips, but my real suspicion is that they simply looked past this game. That is not going to happen this week following this huge wake-up call. Take the Razorbacks to bounce-back with a big win that covers the 9.5-point spread.